The Central Bureau of Investigation (CBI) has suspended Inspector Ashok Yadav, who reportedly manhandled and slapped Inspector Rajesh Shukla on September 3 after the CBI arrested him and two other policemen while allegedly taking a bribe of Rs 10,000. After a two-day search operation during which chopped body parts of a man were found packed in polybags, the Panchkula police today stumbled upon the head of the victim in a manhole in Sector 28 here. The Panchkula Administration is ‘religiously’ asking its voters to exercise their franchise during upcoming Vidhan Sabha elections. Devotees visiting temples, gurdwaras and mosques in Panchkula would be urged to vote. 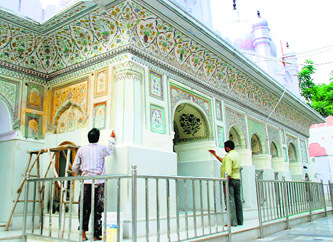 Finding religious places the best platform to educate voters to vote, the Administration has decided to install banners and hoardings in this regard. This time Ramlila committees in the city will not only stage Ramayana, but will also lend helping hand to the flood victims of Jammu and Kashmir for their rehabilitation. To help the flood victims, Ramlila committees will set up donation boxes. 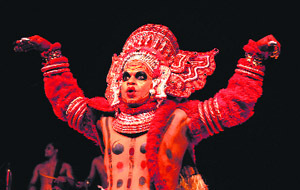 These announcements will be made by artistes, who will be performing the roles of Lord Rama, Hanuman and even Ravana. The Joint Electricity Regulatory Commission (JERC), has given a 15-day time period to city residents to submit their suggestions/objections for the determination of solar power tariff and framing of Draft Solar Power Tariff — Ground Mounted Grid Connected and Solar Rooftop with Net Metering Regulations — 2014. 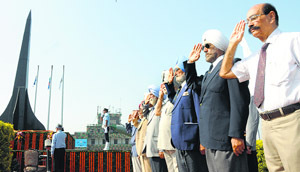 For a large number of Air Force veterans who had fought the 1965 Indo-Pak war, it was like turning back the hands of the clock and re-living the moments of glory as they lined up in front of the war memorial at the Chandigarh Air Force Station today. The UT Excise and Taxation Department has reportedly decided to justify the current system of charging value added tax and service tax on the entire bill amount by hotels and restaurants. In its reply to the Excise and Taxation Commissioner, excise officials are learnt to have cited certain judgments to justify their stand on charging VAT on 100 per cent of the bill amount. It seems the Panchkula Administration has not learnt any lesson despite facing flak for ‘not looking after’ an elderly destitute in pain. Two women — one in her early twenties, who had been abandoned by her in-laws and another mentally-challenged — were found lying outside the bus stand in Sector 5 for the past 25 days. Even though its been around two-weeks since the councillors and officials returned from the nine days study tour, the authorities have failed to include the report of the study tour in the agenda for the forthcoming General House meeting. The MC had spent around Rs 27 lakh on the junket. Though the state government is yet to decide on dates of Municipal Corporation elections, the factionalism in Shiromani Akali Dal’s local unit has started coming to the fore. Supporters of Kulwant Singh, who had contested the recent Lok Sabha elections on the party’s ticket from Fatehgarh Sahib, have openly announced that they would not support the party candidates in the MC election if contested under the leadership of Balwant Singh Ramoowalia, the party’s in-charge for Mohali district. As many as 86,307 children were immunised during the sub-national immunisation round campaign in Chandigarh. As per the directions of Government of Indiathe sub-national immunisation round was observed for two days in the city. The Department of Anatomy, PGIMER, Chandigarh, today received the body of 82-year-old Bimla Kumari, for research purposes. Earlier, Kumari had pledged to donate her body to the department. The department thanked the family members for the noble gesture. Students of the Indian School of Business (ISB) here will organise ISB Joyathon, a run to promote the cause of giving among residents of the tricity, at Sukhna Lake, Chandigarh, on September 28. The State Leprosy Society performed reconstructive surgeries on 12 affected persons during a camp held at the General Hospital here today. This was the first camp on reconstructive surgery organised for leprosy patients in Haryana. The camp was organised with the assistance of the Regional Leprosy Training Institute, Raipur, Chhattisgarh. Haryana does not own a reconstructive surgery centre. Though the Haryana Janhit Congress (HJC) is yet to release its list of candidates, Chander Mohan, one of the strong claimants for the Panchkula Assembly seat, has already kicked off campaigning. Chander Mohan visited 14 villages in Panchkula and sought vote for himself. He told the villagers that he had been a localite and was associated with the city since long. Sources said Chander Mohan would be visiting other villages tomorrow. The HJC is expected to release its list by September 25. Chander Mohan, a former Haryana Deputy Chief minister, is the brother of HJC chief Kuldeep Bishnoi. Confusion prevailed at the University Institute of Chemical Engineering and Technology (UICET), Panjab University, as the authorities are yet to decide on the resignation of the department head, Dr US Shivhare, submitted to the Vice Chancellor about one month ago. Chandigarh: As may as 16 students from Vivek High School will visit Germany and work on the project “Understanding our Borders” under the aegis of the PASCH Project initiated by the German Foreign Office. The students from Class IX, XI and XII will work on a project themed at ‘Understanding our borders (Indo-Pak & the rise & fall of the Berlin Wall)’ which has to be expressed through art. The University School of Open Learning (USOL), Panjab University (PU), will conduct counselling for four general category seats of MEd on September 24. The counselling will be conducted from 9 am to 10 am at the USOL auditorium. Candidates with merit marks from 53.0166 and above can attend the counselling. The local court today pronounced five-year term to a woman for abetting her daughter-in-law suicide while six other family members, including three women, were acquitted in the case. The Chandigarh Police arrested three youths for quarreling with a constable outside the Buzz Pub in Sector 17 on late last night. Police officials said that constable Muni Ram who was on night duty at the Neelam Police Post, Sector 17, received information that some youths were fighting outside the pub. Poor refereeing has been a common sight during the 12th Administrator’s Challenge Cup Football Tournament since years. 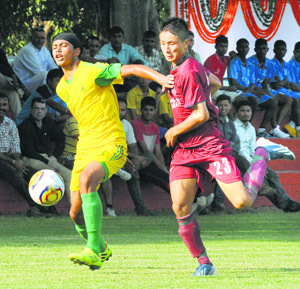 The same scenario was witnessed during the opening match between Mahilpur Football Academy, Punjab, and Mohun Bagan SAIL Football Academy at the football stadium in Sector 17 today. The Sports Authority of India (SAI) and Directorate of Sports, Panjab University, seem to be going to any extent to support their “favourites”. Sample this: A SAI football coach, appointed at the extension coaching centre being run at Panjab University (PU), managed to get his transfer orders cancelled twice in the past four months. Chandigarh Academy for Rural Tennis (CHART) trainees of the CLTA continued to hog the limelight during the CLTA-AITA Talent Series (TS-3) Tennis Tournament being played here. In the semifinals of boys’ category, CHART trainee Shashikant drubbed CHART trainee Krishan Hooda.